On the Thursday matinee, when I was in to watch Singin' in the Rain, the majority of the stalls seats were full to brimming with enthusiastic pensioners, seemingly all out on a nippy November afternoon for a stroll down memory lane. SODS have recently recruited a healthy bunch of younger performers into their fold, with their most recent show reflecting this intake with a fabulous production of Rock of Ages. They also took a risk, going out on a limb with the not so well known, Dirty Rotten Scoundrels, something a little more, shall be say 'risque' for their more 'traditional' audience base and while these shows received critical acclaim, they don't always get the 'bums on seats' that local am-dram groups need to survive. Singin' in the Rain however, is a sure-fire show to grab an audience and this certainly seems the case for SODS latest production. 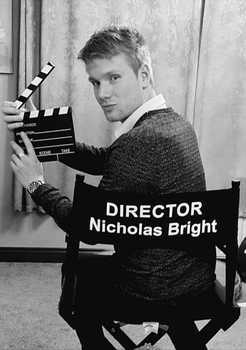 It is also a huge undertaking for any director, let alone a first time one, and Nick Bright obviously has no fear or is completely bonkers! Reflecting the age dynamic of the group, this show features a cast that I would consider quite a bit younger than one would expect for the leading roles but nonetheless, Rob Maynard, Ewan Dunlop and Kirsty Bone along with Nick have, without a doubt, put in an awful lot of hard work and this certainly comes across in their performances. Singin' in the Rain takes us to a time just before the talkies come into fashion in the motion picture industry. Don Lockwood and Lina Lamont are the studio's heartthrobs but when the decision is made to bring in talkies, something has to be done about Lina's awful voice - think Janice in Friends. Fortunately, Don bumps into Kathy Selden who, it is discovered, has a beautifully melodic voice and they come to the idea of dubbing her voice over Lina's. Of course, things don't go to plan, especially when Lina finds out. Rob Maynard enthusiastically plays the part of Don Lockwood, the role played by legendary dancer Gene Kelly - a huge undertaking - and I understand has only had 6 months of tap dancing lessons for the role. Looking a little more Justin Bieber than Gene Kelly, Rob does a nice job in the dance routines and copes well with all of his numbers, but particularly stands out when he is dancing with Ewan Dunlop who plays the role of Don's best friend, Cosmo. Again, rather more younger than one would expect for this role, Ewan still gives Cosmo some great characterisation and proves that he is a natural in comedic roles. I particularly enjoyed his number Make 'Em Laugh. He also did a lovely job with Broadway Medley number and a huge credit has to go to choreographer, Sarah-Rose Dunn, who has worked some sort of magic with the SODS ensemble producing some really impressive dance routines. 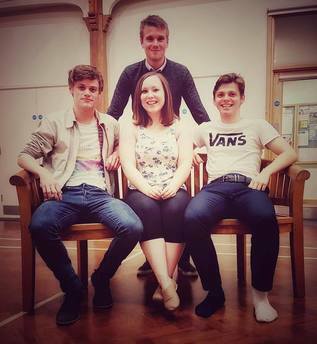 For a society who are predominantly known for their singing endeavours, this production has shown that they can pick up a dance routine just as well as the rest. Credit here to Milli-Mae Cage who particularly stood out in all of her dance numbers. Kirsty plays Kathy nicely, making her rather coy and demure. She also has a lovely clarity to her speaking and singing voice however, it would have been nice to see her give Kathy just a tad more gumption. Her and the boys did a lovely job of Good Morning. Someone who certainly doesn't need any extra gumption is Miss Laura Mann who completely smashes the part of Lina Lamont and probably had a few of the blue rinse brigade adjusting their hearing aids with that voice. This really is a peach of a part and Laura fabulously seizes every opportunity to bring out every ounce of comedy to Lina not least in her song, What's Wrong With Me. Declan Wright also stands out with his performance of Beautiful Girl as the Tenor Male. There are also some nice cameo roles from Johnny Buxton and Les Cannon as Studio Boss, R F Simpson and Director, Roscoe Dexter and Ashleigh-Marie Stone as Dora Bailey. This is a pretty long show with the first Act almost an hour and half and some scenes did feel somewhat laboured. However, this made the anticipation of the Singin in the Rain number at the end of Act One all the more delightful and yes, you will be pleased to learn that there is a bit of rain and some splashing to be had. The use of upstage projection helps scene changes move along at a fair pace and the black and white film projections went down well with giggles from the audience. MD, Elizabeth Dunlop does a good job keeping the orchestra going. I think it's safe to say that the Thursday matinee audience had a jolly good trip down memory lane and will no doubt be thrilled to learn that SODS next production will be another classic, Kiss Me Kate.